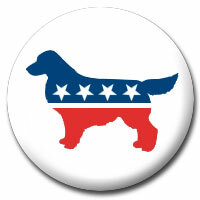 A special thanks to Grins for sending this "political" button along. The Golden Party is eternally grateful to have her as a member. Now I can't wait for the donations to start rolling in! The Golden Party appreciates all donations, large or small. As with any charitable contribution, a small part of the proceeds will go towards administrative expenses. Thanks again Grins, you're a peach. LOL! Do Molly and Tess share your interest in your administrative expenses? Snow, I'm hoping the dogs can't read. I've promised them milkbones and rawhides. Shhhhh. LMAO!! I LOVE the administrative expenses! Thank goodness the dogs cant read, they might want some too. Beer is forbidden. But, they are always eager to wag their stain makers and knock over fresly opened beers. For some reason they never go near the empties.